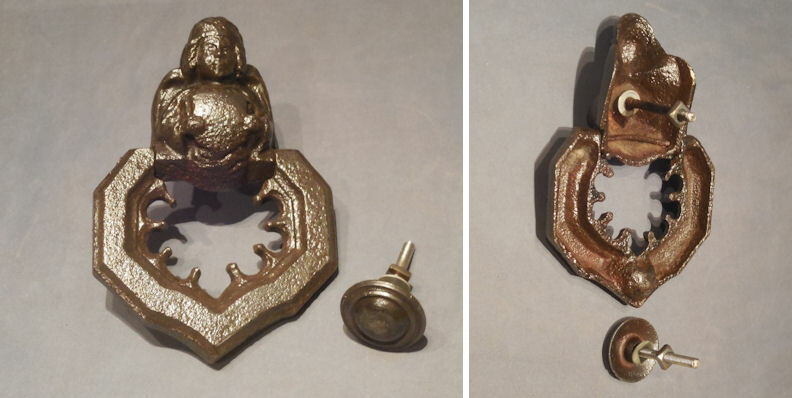 Original, quality late 19th century cast iron door knocker impressed to the reverse for the manufacturer "A. Kenrick & Sons" of West Bromwich and "No 425" for the model number also with the registration lozenge mark for the year 1883. 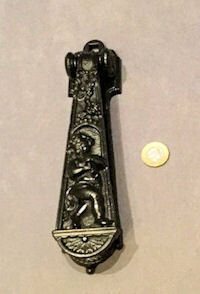 The knocker bar is highly embossed with good detail of a cherub playing a flute and the backplate has embossed detail of musical instruments. All has been cleaned and repainted black and is complete and in good and working order. 9" x 2" x 1.5" front to back. 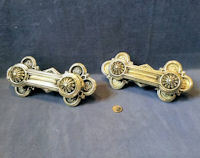 Original, quality matching pair of late 19th century cast brass door knockers of a good size. One with a registered lozenge mark to the reverse and one without, otherwise both are identical and most unusual to find a pair. The threaded nuts and bolts have been replaced, polished and are complete and in good and working order. 9.5" x 4.25" and 2" front to back. 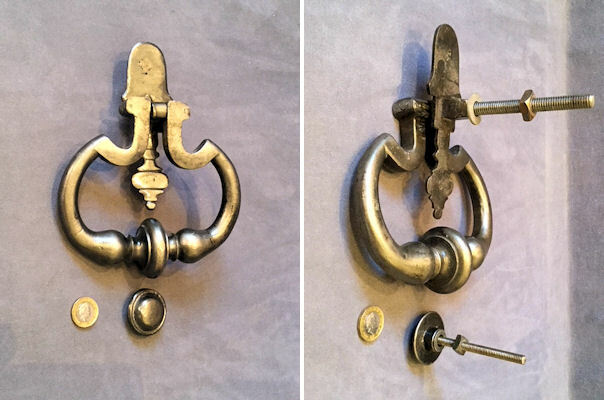 Original, quality late 19th century cast iron door knocker of the drop loop form with replacement threaded bolts, nuts and washers. 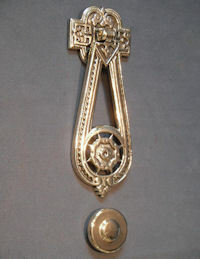 This example has an interlaced loop for the knocker and acanthus leaf forms for the backplate. All has been cleaned and repainted gloss black and is complete and in good and working order. Backplate 8.5" x 3.25" and total 2.5" front to back. 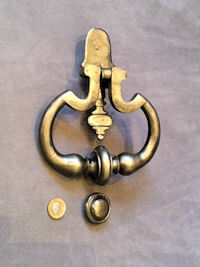 Original, quality mid to late 19th century blacksmith made wrought iron door knocker of large proportions with a "Georgian Bow" drop ring knocker with a small decorative backplate and a replacement cast iron knocking stud. Replacement threaded bolts, nuts and washers have been fitted; and all is cleaned and lacquered and complete and in good and working order. A super door knocker of an unusual form. Backplate 8" tall x 6" wide and 2" front to back. Knocker 5.5" tall x 2" wide. 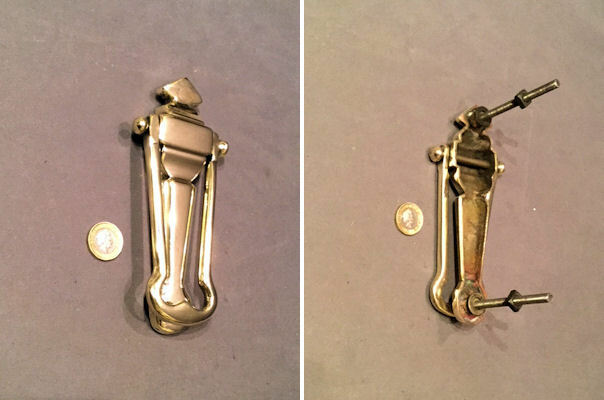 Original, quality 1920's small cast brass door knocker of the drop loop form. Replacement nuts and bolts have been fitted and all is complete and in good and working order. 6.5" x 3" and 1" front to back. 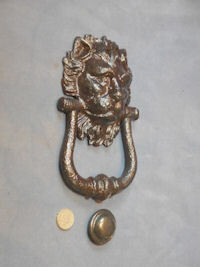 Original, quality 19th century cast brass door knocker. This super example has a drop bar knocker impressed with an Aesthetic Movement design and the wider and shaped backplate has the same matching detail. Replacement nuts and bolts have been fitted and all is complete and in good and working order. Backplate 9" x 4.5" and 2.25" front to back. 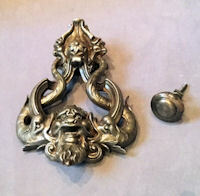 Original, quality mid 19th century very detailed and large cast iron door knocker with a replacement knocking stud made to suit and replacement threaded bolts and nuts fitted. This superb example has two entwining stylised fish either side of a bearded head and another pair of mythical beasts devouring the tails of the fish. The reverse is impressed with the registration lozenge mark for the year 1842 and also 'No 1692' and '22' both in script for the model numbers. This example is detailed in the Kenrick Catalogue of 1876 but it has the code number 299. All has been cleaned and lacquered and is complete and in good and working order. 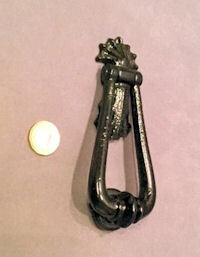 A most unusual cast iron door knocker, the first we have seen and a huge one at that. 9.5" drop x 6.25" widest and 2.5" front to back. 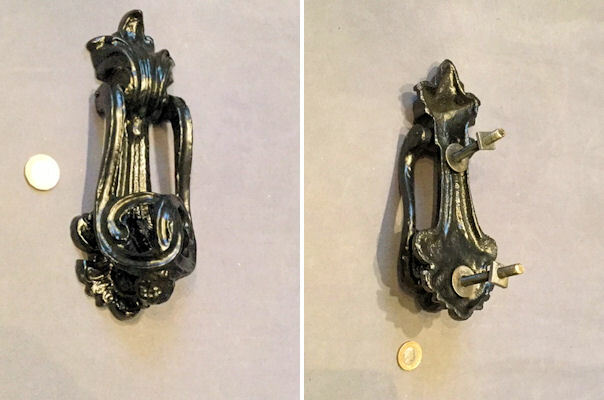 Original, quality late 19th century very decorative cast iron door knocker of the drop loop form with Acanthus leaf designs with a bud to the top. An original brass plate is mounted to the top for engraving with name of the house or the residents. The original cast and hand cut threaded nuts have been retained as have the bolts. 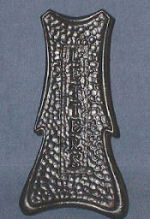 The reverse is impressed "Kenrick" for the maker A. K. Kenrick Iron Foundry West Bromwich. All has been cleaned and lacquered and is complete and in good and working order. A most unusual example. 8.75" x 3.75" and 1.5" front to back. 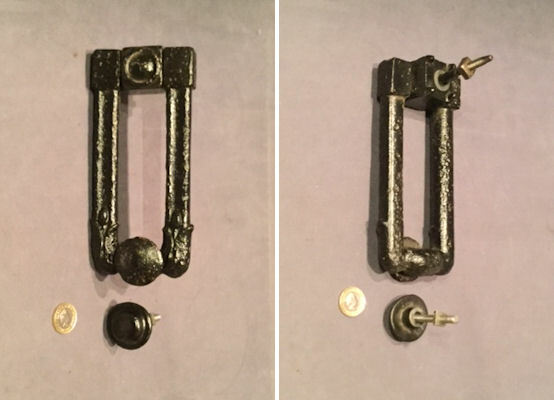 Original, quality late 19th century cast iron door knocker of the drop loop form with a replacement cast iron knocking stud and replacement nuts and threaded bars fitted. All has been cleaned and repainted black and although a little pitted and weathered it is a good solid knocker. Complete and in good and working order. 7" x 3.25" and 1.5" front to back. Stud 1.5" diam. 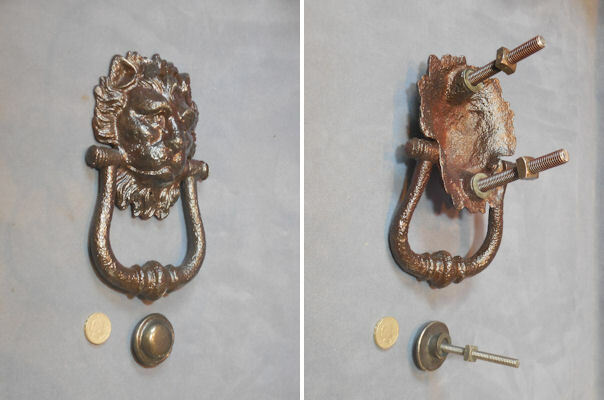 Original, quality mid 19th century cast iron door knocker in the realistic from of the face of a male lion. This very detailed knocker has a drop loop, a replacement knocking stud and replacement nuts, washers and threaded bars made to suit. All has been cleaned and lacquered and is complete and in good and working order. 7.5" tall x 4.5" and 1.5" front to back. 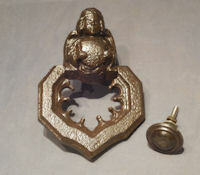 Original, quality late 19th century small cast iron door knocker of the drop loop design with the backplate simulating two seashells. Replacement nuts and threaded bars have been fitted and a replacement knocking made to suit. All has been cleaned and repainted black and is complete and complete and in good and working order. 5.75" x 2.25" and knocking stud 1.25" diam. Original, quality 19th century cast iron door knocker of the drop loop form with a cross-shaped backplate and acanthus leaves overall. A superb example of top quality casting from this top cast iron foundry "A Kenrick and Sons of West Bromwich", a replacement cast iron knocking stud and nuts and bolts have been fitted, all has been cleaned and lacquered and is complete and in good and working order. 11" x 4.5" and 1.5" front to back. 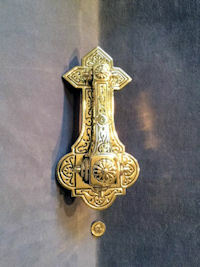 Original, quality late 19th century unused brass door knocker of the drop loop design all in the original two tone matt gilt finish. The knocking stud and the nuts, bolts and washers are all replacements made to suit and all is complete and in good and working order. The reverse of the backplate of the knocker is impressed with the registration lozenge mark for the year 1849. 9.25" long x 4"wide and 1.75" front to back. Original, quality, mid to late 19th century, cast iron door knocker of the drop ring form with an old replacement circular knocking stud. This most unusual knocker has a winged angel holding a heraldic shield over the shaped knocking ring. Replacement bolts have been fitted and all has a good weathered and pitted finish and is complete and in good and working order. Has been cleaned and finished in a clear coat of lacquer. 9" tall, 6" wide and 2" front to back, knocking stud 2" diameter. 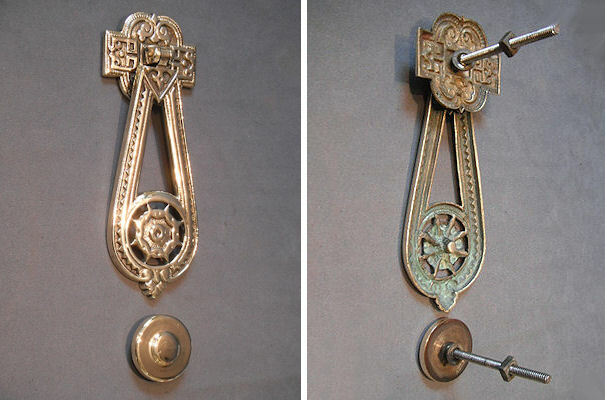 Original, quality, cast brass Art Nouveau door knocker with a good drop loop form on a shield shaped backplate and the original knocking stud. 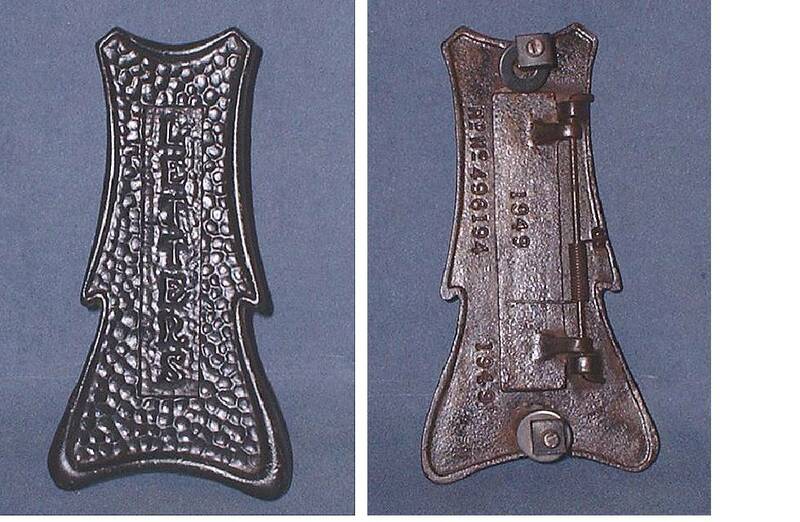 The reverse of the backplate is impressed with the registration number for the year 1903. Replacement nuts and bolts have been fitted and all is complete and in good and working order. Total tall 5.75" x 4" and 1.25" front to back, knocking stud 1.5" diameter. 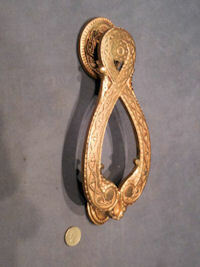 Original, quality, cast brass door knocker of the dropped loop shape, circa 1880 / 1900, with an Aesthetic Movement design overall. A plain replacement knocking stud has been made to suit and replacement nuts and bolts have been fitted. All has been polished and is complete and in good and working order. Total drop 8.5" x 3" wide. 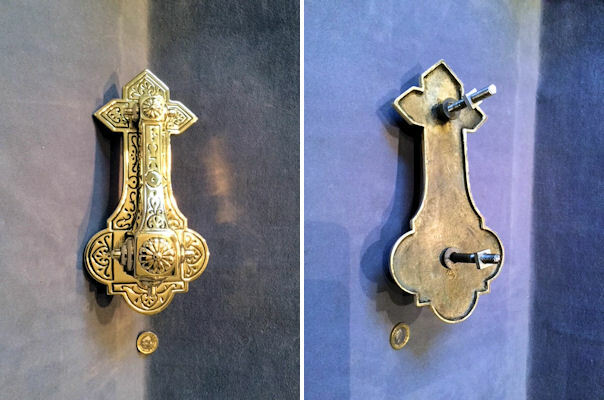 Original, quality, late 19th Century, cast brass door knocker with a replacement backplate, knocking stud and threaded bolts, nuts and washers fitted. This dropped loop knocker has an embossed Aesthetic Movement design, has been polished and is complete and in good and working order. Backplate and stud 2.25" diameter, total 7.5" x 2.75" and 1.5" front to back. Original quality, 19th century, large cast iron door knocker, in the form of branches and leaves with an eagle with wings spread to the top. Replacement nuts and bolts and a new pin to the knocker pivot have been fitted. Now cleaned and finished in a clear lacquer, all is complete and in good and working order. 12.75" tall x 5.75" wide x 2.5" front to back. Original, quality 1930's plain cast yellow brass rectangular shaped letter flap with a good sized aperture and a strong spring. Replacement nuts and bolts have been fitted and all is complete and in good and working order. Exterior 12" x 4". Aperture 9" x 2". Bolt centres 10.5". 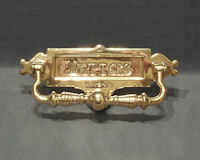 Original, quality 1920's cast yellow brass letter flap of a simple form with "Letters" embossed in upper case to the flap. Replacement nuts, bolts and spring have been fitted and all is complete and in good and working order. Exterior 8" x 3.5". Aperture 5.75" x 1.5". Bolt centres 6.75". 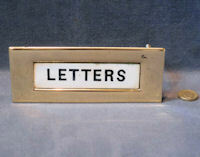 Original, quality 1930's / 40's heavy cast brass letter flap of good proportions. This heavy duty example of a plain form has a weighted flap with a replacement bar and springs and replacement threaded bars and nuts have been fitted. 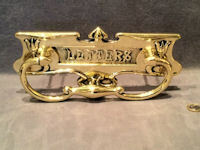 A great letter flap and difficult to find these larger ones in yellow brass. Complete and in good and working order. Exterior 14" x 5.75" x 0.5". Aperture 10" x 2.75". Bolt centre 12". Original, quality 1930's / 40's large yellow brass letter flap of a plain form with a good sized aperture with "Letters" in upper cased text to the flap and four threaded bolts with quality slotted covers for the reverse of the door. A good usable letter flap all around. Complete and in good and working order. Exterior 12" x 4.5". Aperture 9.75" x 2.25". Bolt centres 10.75" and 3.5". 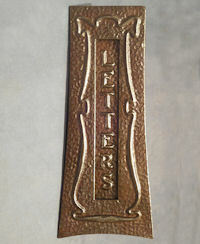 Original, quality 1920's beaten copper letter flap in a serious 'Arts and Crafts' design and in the old unpolished finish. This super example has a bold hammered finish, a good sized aperture with "Letters" in upper cased text, five screw holes for mounting and a good strong replacement spring fitted made to suit. Complete and in good and working order. Can be polished to shiny copper on request for no extra cost. Exterior top 12.75". Exterior max 18.25". Centre height 4.5" and max height 7". Aperture 7.5" x 1.75". Original, quality 1930's / 40's large cast brass pink letter flap of a plain design with a good sized aperture and replacement nuts, bolts and spring fitted. Complete and in good and working order. Exterior 13.75" x 4.5". Aperture 11" x 2". Bolt centres 12.5". Original, quality 1930's / 40's large cast brass pink letter flap of a plain design with a good sized aperture and replacement nuts, bolts and spring fitted. Complete and in good and working order. Exterior 12" x 5". Aperture 9" x 2.5/8". Bolt centres 10.5". 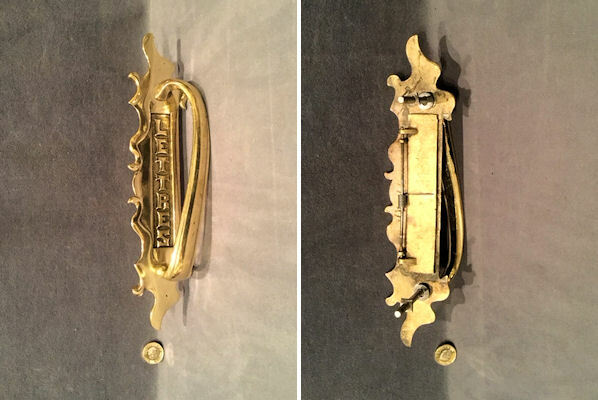 Original, quality, circa 1900, cast brass vertical letter flap with "Letters" embossed to the flap and with a curved and shaped vertical pull bar handle. Replacement nuts, bolts and spring have been fitted. A most unusual example. Complete and in good and working order. Exterior 11.5" x 2.75". Aperture 5" x 0.75". Bolt centres 7". 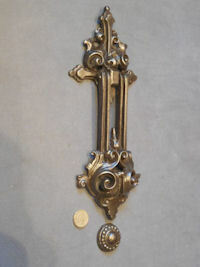 Original, quality 1920's large cast brass letter flap with an integral door knocker in a serious Art Nouveau style. The backplate has embossed detail of plant forms, the aperture flap has "Letters" in stylised upper cased text, and the large horizontal knocker is again in plant form. The reverse is impressed 'CJS' for the manufacturer and replacement spring bar, spring and threaded bolts have been fitted, and all is complete and in good and working order. A great looking piece of Art Nouveau. Backplate 11.5" x 4.5", aperture 5.5" x 1.25" and bolt centres 7". Original, quality 1920's cast pink brass letter flap of good proportions with an integral drop ring door knocker fitted below. 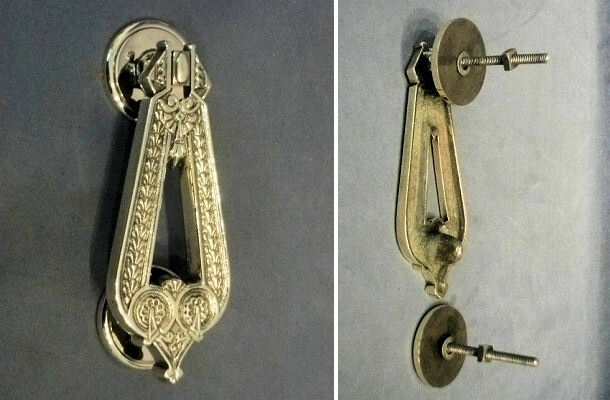 A replacement but matching brass knocking stud is included. This most unusual example has replacement bolts and spring to the reverse and is complete and in good and working order. Total drop including knocker 7" x 9" wide, aperture 6.5" x 2", bolt centres 7.75" and knocking stud 2" diam. Original, quality 1930's / 40's large cast pink brass letter flap, with a good sized aperture and four slotted brass bolt covers for the reverse of the door. This superb example has a reeded outer edge to the frame and replacement threaded bolts and springs fitted. All is complete and in good and working order. Exterior 14" x 4.5", aperture 11.75" x 2". Bolt centres 12.75". 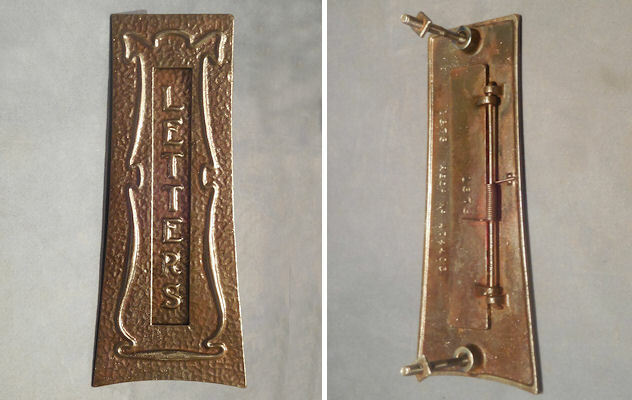 Original, quality brass letter flap in a serious art nouveau design, with a shaped backplate, the letter flap is impressed ' Letters ' in upper cased decorative text and the reverse with the registration number for the year 1903. Replacement nuts, bolts and spring have been fitted and all has been fully overhauled and polished. A great looking letter flap and is complete and in good and working order. Backplate 10" x 4.25" and aperture 6" x 1.25". 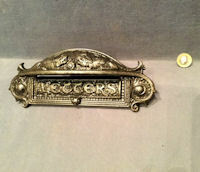 Original, quality late 19th century letter flap with a cast brass surround and a most unusual letter flap in white ceramic with "Letters" in black upper cased text. Replacement nuts and bolts have been fitted. One blemish to the front of the brass surround otherwise all is complete and in good and working order. Only the second one we have owned and seen. Exterior 6.5" x 2.5", aperture 4.5" x 1.25" and bolt centres 5.75". Original, quality 1920's / 30's, vertical mounted cast iron letter flap with embossed Art Nouveau decorations and "Letters" in upper cased text. A replacement spring has been fitted, all has been fully overhauled, cleaned, lacquered and is complete and in good and working order. Exterior 9.5" tall, top 3", base 4", aperture 6.5" x 1", bolt centres 8.5". Original, quality, late 19th century, cast brass letter flap with decoration in deep relief and "Letters" in upper cased text to the flap. Although the aperture is not huge the detail of the decoration is superb. 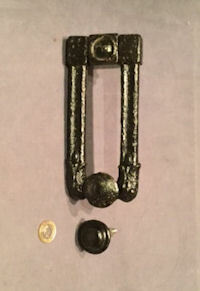 This example has a counterbalance weight to the reverse of the flap instead of a spring and bar and has replacement threaded bars, nuts and washers. All has been polished and is complete and in good and working order. Exterior 6.75" x 3", aperture 5" x 1.25". 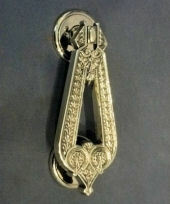 Original, quality 1920's, cast brass door knocker with an integral letter flap. This unusual example has a heavy shaped knocker, "Letters" in upper cased 'Gothic' style text to the letter flap and "Knock" beneath. The reverse is impressed "JCS" for the maker James Cartland and Sons of Birmingham and replacement bolts have been fitted. Not a large aperture, but overall a good looking knocker and letter flap and in good working order. Exterior 9.25" x 3.75", aperture 5" x 1.25", bolt centres 7". Original, quality 1930's / 40's, plain cast pink brass letter flap of good proportions, replacement nuts and bolts have been fitted and all is complete and in good and working order. Exterior 12" x 5", aperture 9" x 2.5", bolt centres 10.5". Original, quality, cast pink brass letter flap of reasonable proportions, with an integral heavy door knocker, circa 1900. This example has an unusual layout. A replacement springhas been fitted and all is complete and in good and working order. Exterior backplate 9" x 4.75", aperture 6.25" x 1.5", bolt centres 7.5". Original, quality 1920's, cast pink brass letter flap, with an integral door knocker of an unusual form, with a ring shaped knocker suspended beneath the letter flap. 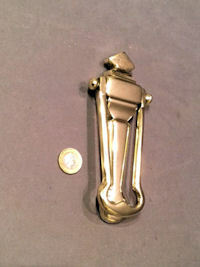 The letter flap and surround are plain, although the knocker has an Art Nouveau style. The bolts are replacements made to suit, as is the knocking stud. All is complete and in good and working order. Exterior frame 7.75" x 3" total drop, including knocker 6.5", aperture 5.5" x 1.25", bolt centres 6.75". 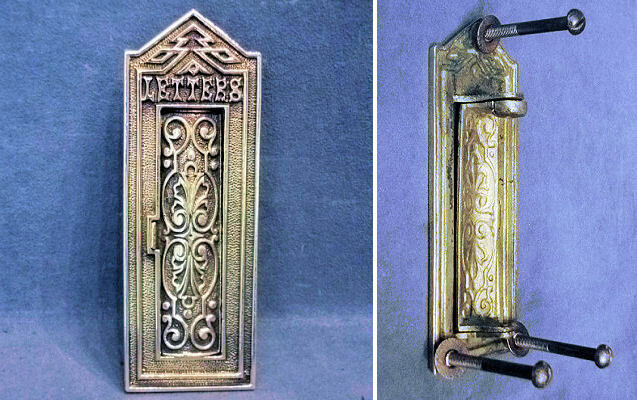 Original, quality 1920's, cast brass letter flap in the Arts and Crafts style, with a shaped outer edge and replacement nuts, bolts and spring fitted. This example has a fairly small aperture and does have some blemishes to the top edge of the flap and above, otherwise all is complete and in good and working order. Exterior 9" x 3.25", aperture 5.5" x 1.25", bolt centres 7". Original, quality 1920's, cast pink brass plain letter flap with replacement nuts and bolts fitted. Complete and in good and working order. Exterior 8.25" x 3", aperture 5.25" x 1.5", bolt centres 7". 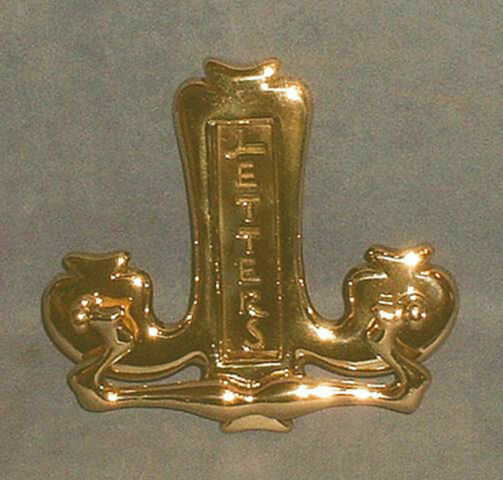 Original, quality, late 19th century, small cast brass letter flap, with a horseshoe decoration over the top and "Letters" impressed to the flap. The upper cased text is fashioned using the horseshoe motif and the reverse is impressed "96", with the registration lozenge mark for the year 1879. The original threads and nuts are still fitted and a weighted bar has been added to the flap to give it closure. Although it does have a tiny aperture for letters, it is an interesting variation, complete and in good and working order. Exterior 7" x 3", aperture 4.25" x 1" and bolt centres 6". 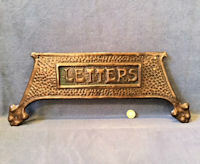 Original, quality 1920's, cast iron letter flap, with impressed decoration of circles and horizontal ribbing. The reverse is impressed "Kenrick" for the manufacturer 'A.Kenrick and Son of West Bromwich' and "No 36" for the model number. Replacement nuts, bolts and spring have been fitted and all has been cleaned and lacquered and is complete and in good and working order. External 8.25" x 2.75", aperture 4.25" x 1.25", bolt centres 6". 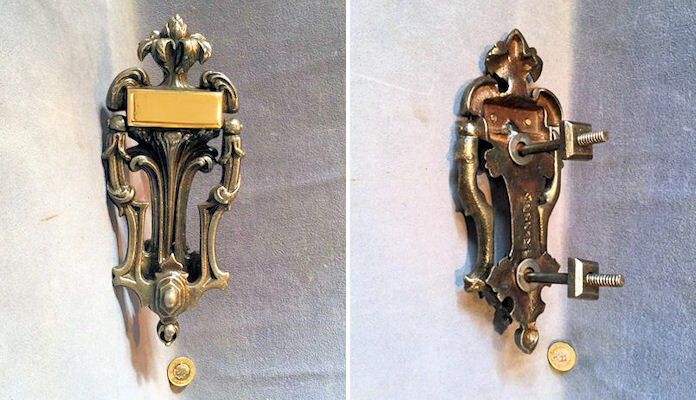 Original, quality, circa 1900, cast brass letter flap with an integral door knocker. This example is decorated with vertical lines in relief and "Letters" in gothic type to the letter flap. Replacement nuts, bolts and a spring have been fitted, all has been fully overhauled and is complete and in good and working order. Aperture 4.5" x 1.5", whole 8" x 4" and 1.5" front to back. 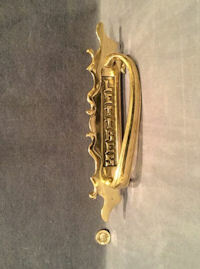 Original, quality, 1920's cast brass letter flap with an integral door knocker in a plain but shaped form. Replacement nuts, bolts and spring have been fitted and all is complete and in good and working order. External 8.5" x 4" x 1" front to back, aperture 4.5" x 1.25" and 6.25" bolt centres. Original, quality, 1920's, cast brass, vertical mounted letter flap, with a spring loaded cover to the aperture and three rear mounted steels bolts and washers. The face of this example has acanthus leaf embossed decoration to the cover and 'Letters' in upper case above. Not a great size aperture, but unusual to be vertical. All is complete and in good and working order. External 6.75" x 2.5" and aperture 4.25" x 1". Original, quality, 1920's, cast brass, vertical letter flap with a 'gothic' style backmount and 'Letters' in script to the flap. An unusual example; complete and in good and working order. External 11.75" x 4.5" and aperture 4.75" x 1.5" and 6.5" bolt centres. Original, quality, 1920's, chrome plated on brass, plain letter flap with replacement nuts and bolts fitted. All is complete and in good and working order. 8.5" x 4", aperture 6.5" x 2.25". Click on photo for larger or other views. Original, quality 1920's cast pink brass, plain letter flap, with a replacement spring and bar fitted. All is complete and in good and working order. Exterior 8.25" x 3", aperture 6" x 1.75" bolt centres 7.25". Original quality cast pink brass Post War vertical letter flap with a small door knocker and the facility to house a Yale lock barrel face. Replacement nuts, bolts and spring have been fitted. Has been polished, lacquered, fully overhauled and is complete and in good and working order. Backplate 8.25" x 2.5", aperture 4.75" x 1.5"+ 1.25" front to back. 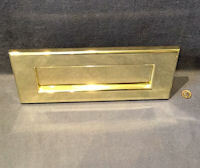 Original quality cast brass Post War vertical letter flap with a small door knocker and the facility to house a Yale lock barrel face. Replacement nuts, bolts and spring have been fitted. Has been polished, lacquered, fully overhauled and is complete and in good and working order. Backplate 11.75" x 2.25", aperture 5.25" x 1.5"and 1" front to back, bolt centres 7.75". Original quality, 1920's, pressed copper letter flap with an embossed design to the surround and 'Letters' in gothic, upper cased type style. A small but pretty letter flap complete and in good and working order. 6.25" x 2.5", aperture 4.5" x 1" and 5.5" bolt centres. To be mounted using 2 bolts or screws, not included. Original quality, 1920's, brass letter flap of an unusual design, with a shaped cover to the aperture with 'Letters' in upper case. A brass plate has been fixed to the top face covering up a previous owner's name and can be removed for engraving if required. Replacement nuts and bolts have been fitted and all is now complete and in good and working order. 7.75" x 4" x 0.5", aperture 5" x 1.25", bolt centres 5". 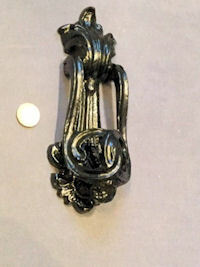 Original quality cast iron vertical letter flap in the Art Nouveau form, impressed to the reverse with the model no. 1949 and the registration number for the year 1907. Has been repainted and is complete and in good and working order. 7" tall x 3.75" wide, aperture 4.25" x 0.75", bolt centres 5.75". 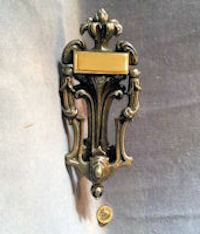 Original quality unused brass letter flap of an Art Nouveau style, circa 1900. Replacement nuts and bolts fitted. Complete and in good and working order. Exterior 8" x 3.25", bolt centres 6". Aperture 5" x 1.5" high. 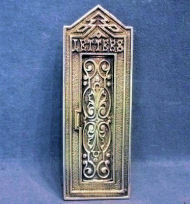 Original quality brass vertical letter flap, circa 1900, cast with 'Letters' and with an integral door knocker beneath. Marked to the front 'Registered Sample'. Complete and in good and working order. 8" wide x 7.25" tall x 1.25" front to back.